Get down the trail fast, without compromising comfort and protection, when you're wearing The North Face Ultra 109 GTX Hiking Shoe. Beneath the breathable mesh construction is a GORE-TEX® membrane that ensures complete waterproof protection, which works perfectly with the PU-coated leather mudguard to keep your feet dry and comfortable no matter what. Underneath the UltrATAC™ outsole gives you powerful grip on gravel, mud, or grass, and the EVA midsole works with the included OrthoLite® insole to cushion and support every step. This is my third pair of the 109s - I wear them 200 days a year, and they last about two years. I use them for commuting - to the office, walking, light hiking, light activity. They are 100% waterproof (amazing!) I will replace my current pair with another 109, or with another, better NF shoe with the same last. Also, very surprised at the people who said the shoes were uncomfortable - these shoes felt the same from the first wear - so, if they don't feel comfortable in the store, don't buy them. 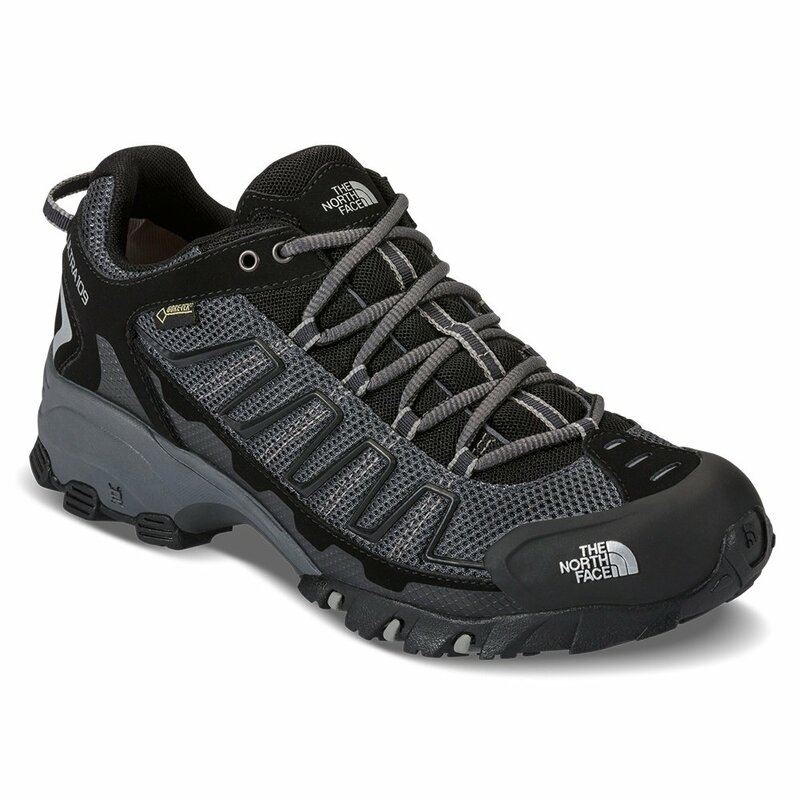 I like The North Face shoes and I still do, but I do not like how these were designed. I had the Headgehog GTX XCR III Hiking Shoes my entire year in Europe and they lasted. I bought the ULTRA 109 while I was home in USA to replace them as they are comfortable and look good. Now I'm in Europe again and discovering what is wrong with the ULTRA 109. That beautiful toe cap is shaped like a blade and while bending the foot during normal walking, it cuts right into the material of the shoe. This leaves nice holes in your shoes. Mine didn't even start to look old before I noticed the holes, and had thought I had done it somehow. But unfortunately these shoes destroy themselves and it is unavoidable. Not too good a feature for water resistance either. I would have bought a different shoe for my trip to Europe if I knew these would do this. Over the years I have consistently used Merrell shoes. Recently I decided to try north face because I have been very satisfied with all their other products.. I've had the shoes for a couple of months now and they have slowly broken in. They are stiffer than my other shoes but I consider that to be an asset now that I've been wearing them for a little bit. So far very happy with the shoe we will see how they hold up over the summer an into the fall. My only significant complaint is the first week I was very dissatisfied with the laces and replace them with a better quality laces. I love everything about this shoe, but the ankle section wore out after about 4 months. I bought this shoe to use as a hiking shoe for an around the world trip of a year. The shoe rubbed the back of my foot, so much so that it was bleeding on a six day trek despite the shoe being broken in. Traction was adequate and the shoes did look nice, both for hiking and being around town in a pinch. Six months in, they were coming apart at the seams, with the sole tearing apart. I contacted North Face for a warranty replacement, only to be told I needed to send the original shoes back to the US for "inspection". I was in Chile at the time, and the shipping costs would have been higher than the shoe is worth. When I asked if there was anything else I could do, I was told no, no help at all from North Face in all of Latin America. No offer to send a replacement pair to a friend for them to bring to me, nothing until the original shoe was returned. I wasn't going to carry a disintegrated shoe in my backpack for another six months. Buy this shoe if you'd like it to fall apart on you and then be left high and dry by the company. I won't be buying another North Face product again and certainly will do my best to deter anyone I know from doing so. I am an avid runner and avid hiker. I go through many pairs of shoes per year. In all the shoes in my life I've had 3 pairs that have had hot spots. This pair was one of them. Too much material where the tongue meets the shoe. Not a design issue, it was a build issue. One shoe was different than the other. Sent back to TNF for repairs 3 months ago. Seems like they are overwhelmed b/c my shoes have not returned. Great shoe just needs to be worn to break in before using which is nothing out of normal. Ok so over the past 20 years in the outdoor industry I have owned all the big shoe companies. I particularly like alow hiker for daily wear 3= days a week and outdoor adventures and travel. for the last 6 month I have been wearing my first pr of these shoes. They are great. I have always had shoe issues due to feet problems and am very particular about design. These have been holding up better then I expected by a bug margine. The body of the shoe has fantastic structure and the sturdy sole and heal give fantastic support and stability. I have traveled all types of terrain in several countries over the past few months. They are quickly become my favorite shoe. I will be adding another pr soon not to replace these but to add a different color to the mix. Just buy them! I bought these shoes to wear around our city (Cambridge/Boston) and for walking on the Camino de Santiago in Spain. The Camino mixes paved roads, dirt paths, and rocky trails. Nothing too challenging but some long days-- 20 miles plus. We walked about 250 miles the first year and the shoes were great all the way. The following year we walked 275 miles in Spain and Portugal. Again, the shoes were perfect. This past fall we walked about 70 miles on the Great Ocean Walk in Australia and the shoes (don't they ever wear out?) were again just what I needed-- sturdy but not too heavy. And between those long treks I've logged countless miles around the city and in the White Mountains. Fall, winter (unless there's a lot of snow on the ground) and spring these are my go-to shoes. If they ever wear out I'll buy another pair. Purchased the Ultra 109 shoes for a future trek in the Himalayas. We went on a 3 hour hike to Lost Maples Texas to test the shoes and to begin the break-in process. Initually the shoes felt great on straight and ascending paths but after descending the hills the balls on both my feet were throbbing. I sincerely expected more out of these shoes and should have stuck with the brand I am used to, which I have two pair of. My girlfriend purchased the Storm III mid hiking shoes with the Vibram soles which she loved. Next purchase might have to include the Vibram soles in order to meet my expectations. The Vibram soles on the 109's would've been the perfect combination. I would recommend these shoes for normal hiking and everyday use but not for steep descending treks. Long time user of North Face Ultra 104's, 106's and 2 pair of 109's. My toe cap cut the fabric long before the soles were close to worn out. Unfortunately, I own two pair's of the 109's. First pair probably lasted 4 months before fabric cut rendering them useless to wear to work or anywhere someone would see me. The previous models had a leather piece running from the toe cap around shoe. My 104's and 106's lasted until sole was worn smooth. VERY DISAPPOINTING! This was my go to everyday gore-tex shoe. Please fix the design in the future. Going to try some Salomons for now. I bought this shoe for a recent backpacking trip in the Sierra, based on the review on Outdoor Gearlab. After decades of hiking in boots, the Ultra 109 is a game changer for me and I'll never return to boots. I like everything about this shoe, except its durability. The lugs and outsole show significant degradation after only 5 days & 45 miles with a light pack in the backcountry - all on trail. At this rate, they will be toast after 100 miles. Unfortunately, I can't see replacing them and will have to look for a higher-quality alternative that offers greater long-term value. I live just below the San Gabriel mountains and the Angeles National Forest. I'm lucky to have quick access to numerous trail heads that lead to fantastic trails throughout the front range of the San Gabriels. I'm also close enough to have access to the higher peak area of Mt. Baldy (10,000 ft). Despite being just 18 or so miles from downtown Los Angeles, these mountains and trails are steep and rugged. They are excellent, popular, well-traveled trails, but the terrain is rocky and as you go higher the trails can be extremely rocky in nature. At the height of my obsession with hiking these mountains, I was often doing 6 - 14 mile hikes with 2,000 - 4,000 ft gain in elevation three times a week. The weather is typically hot for 7-9 months of the year and during the winter it rarely goes below 65 degrees during the day. So I was going through boot after boot after shoe after shoe ... looking for something that was very lightweight, yet was also sturdy, stiff and durable. I'm not backpacking, so going up, I want as light a shoe as possible. But coming down, on the rocky trails, I needed something very sturdy and stiff. The lightweight trail runners just didn't cut it for me on the descents of these rough trails. I finally found the North Face 100 series and fell in love. I've been buying the 100 series since it was first introduced and continue to do so. It's fairly lightweight, but it's very sturdy and stiff. And comfortable! These shoes really protect my feet from the wear and tear of these rocky, rough trails. If you need a good, well-built sturdy hiking shoe ... but don't want the weight of a full boot ... I can't recommend the 100 series enough. They were very comfortable and I want another pair but they did wear out quickly. I have had them for 9 months and the right sole is coming off and the left foot has a couple of tears or cut marks. In TNF defense I may have just worn them out. I really could have loved these shoes. If the right shoe performed as the left shoe this would be a 5-Star rating. However, the right shoe took on water leaving me with a sodden sock and wet, cold foot. My qustion to TNF is how this problem could happen. I purchased the Ultra 109GTX for some upcoming trips. I noticed some wetness while hiking in minor exposure to water but didn't feel it was enough to make an evaluation. Then, hiking through Iceland and England I faced very wet conditions. Using full gaters and rain pants the left shoe performed extremely well. Aside from usual dampness due to sweating, my left foot was dry even after days of rain soaked ground and rain. The right shoe, however, took on water very soon to being exposed to rain or wet grounds mainly from the front one-third of the shoe. Water seemed to be getting through the sides of the toe area and the top of the toe area. When I took off my shoes my left sock was relatively dry. My right sock was heavy with water right at the front third. Since one shoe performed so well I can only guess that either the Gortex was defective or some manufacturing defect allowed water to enter the shoe. As this shoe did not perform as designed I can not rate it anything more than one star. I purchased it from a reputable local outdoor retailer who I know will make things right but I am very dissapointed. I would like to replace them with another pair of Ultra109's but wonder if the same thing would happen. This is the second pair of north face shoes I have owned, the first pair were terrible quality and fell apart very quickly. I only gave them a second chance because I had vouchers to spend after returning a jacket of their's which also fell apart (that's a whole other story). After roughly 80 miles of use, mostly on trails which they are allegedly designed for, true to form these are falling apart. The zigzag trim on the inside of the foot started to peel off after a few weeks use but as it was cosmetic I ignored it and continued to use them then, whilst half way up a mountain trail, I felt something catch on a rock and on closer inspection all of the red sections of the sole were starting to peel. I'm only glad I was doing a simple 20 mile hike on well maintained trails. If this had happened somewhere really wild I could have been in real trouble. I tried to return them at a north face shop and now I have to wait 4 to 6 weeks for them to look at them and potentially refund my money. The supervisor was being difficult because they "looked well used"the reason they looked well used is they are supposedly for trail running and trails tend to be muddy in my experience. it also might have been because they were falling apart and looked liked they'd had years of use. I'm going back to using my old Brooks trail running shoes which have well over 1000 miles on them and are still going strong. This experience has left me with the opinion that North face are no longer capable of producing anything of any quality and have become a company who merely make outdoorsy styled fashion clothing for people who rarely if ever get more than a few miles out of the city. I have had these shoes for over a year now, and wear them once or twice per week for hiking and rock climbing. They look great. The waterproofing is outstanding. I have gone hiking in very wet and muddy conditions, and they keep my feet dry. They have been very durable considering the amount of strenuous hiking I have done over the past year throughout the Southwest and Appalachians. The cushioning is very good for hiking shoes. However, they are extremely narrow around the ball of the foot and the toes. My toes are always bruised and in a great deal of pain after each hike (usually 6-10 hours). I got them a half size larger than my foot size, and the salesperson told me that they would be more comfortable after they were broken in, but that has not occurred. I can't wait until I can afford another pair of hiking shoes, and I will definitely not be buying these again. I have owned 5 pairs of the Merrell Moab WP shoes and 2 pairs of Soloman WP shoes, but I always had the same problem with both brands; after 5-6 months of continuous wear the soles would fall apart and waterproofing failed. I bought this shoe on a whim and The North Face has quickly won me over. Owned the Ultra 109 GTX shoe for close to 1.5 years, before I started to see the sole come apart and the material tear, BUT they continue to stay waterproof. I wear the shoe on a daily basis and because I farm, they are constantly exposed or submerged in chemicals and nitrogen that cause most materials to break down. Their unique waterproof liner prevents the waterproofing from failing or holding water in the fabric, unlike any other shoe from competitors. Best shoe I have ever bought and won't hesitate to purchase again in the future. I bought myself this pair just six months ago. I went on some trails just to realise how sooner they started tearing. Absolutely not recommended. A huge disappointment. I tried to use it, to break it in but it is simply too uncomfortable to put on even that I have set it aside, afraid to use given how tight and how it slows your stride. It feels like you are dragging something with your feet. I am a size 9 but this 9 is way too tight and way too narrow. It makes the shoe look odd on my feet given how it hugs your feet and is tiresome wearing it. I have other pairs from other brands but reading all the reviews, I ordered one, liking its look and rugged features, especially the sole. It did get appreciation from co-workers but only the wearer knows where the shoe bites. I think that this shoe was designed more as a fashion statement than actually being what it is made for - comfort in rugged use. All shoes must be made for comfort, a pro which should be at the base of the feature pyramid, but when the base itself is flawed the rest of the features are hardly anything to go by. I have to return it most likely but am not sure if returns will be accepted if used a few times. Will not recommend this shoe if your feet are slight wider (not even full wide but just a tad wider). The laces came as is a threadbare pair was laced on to the shoe. If you plan to use it (with caution), please loosen the laces completely. I am sorry this did not workout for me and it really one of the worst purchases I've made, an expensive one at that! Great product and will buy more from the store.